UPDATE - April 2018 - this restaurant is now closed. 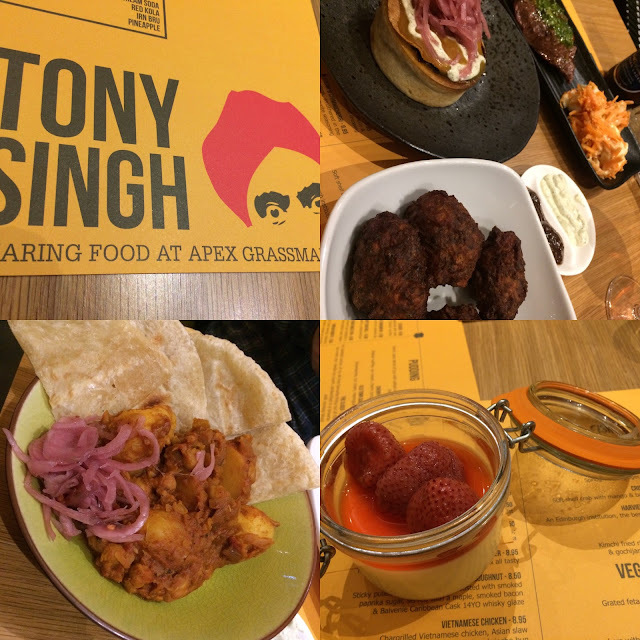 We've been to Tony Singh's Edinburgh restaurant, in the Apex Hotel on the Grassmarket, a couple of times now, the first on a whim and the second time to take family who were visiting. The first time came about purely because I happened to see him walk past our flat. At the time I wasn't certain if it was him but a quick Internet search established he came from Edinburgh and had a restaurant here and so I began to wonder if it had been. Later that same day I went out and happened to see him again confirming that my earlier sighting had most likely been him too and not just someone who bore a slight resemblance. All of this then got us thinking, as we'd become aware of him whilst living in Singapore and had enjoyed a few cooking programmes with him in, and as a result we booked into his restaurant for dinner. Incredibly random I know but that tends to be how we are when it comes to deciding on places to eat, events will often dictate our choices. As a result of having a thoroughly enjoyable experience and some very good food though we returned again, this time taking along some of our family too. The restaurant's concept is all around the sharing of food so the dishes are all quite small to encourage the selection of several. I know people who aren't so keen on that idea but I like it, it's a nice way of trying new things and also means, for the likes of my husband who enjoys fish far more than me, he can still get his fish fix but we can both still enjoy plenty of both of our other favourites too. The first time we visited this concept was expertly explained to us by the staff, alongside the fact that the dishes come out as ready so not to wait for everything before starting to eat. Something we've got used to having lived in Singapore but an idea still quite unusual in the UK so good to know in advance. By contrast though none of this was explained to us on our second visit, maybe we looked like pros but we could have been caught out on the assumption the dishes were bigger, however as I said we already knew how it worked so this wasn't a huge issue for us. The food is a fusion of Scottish favourites alongside flavours and dishes from further afield, it's a fun and enjoyable experience and generally works perfectly for sharing with others. Our visits have included the sharing of haggis pakoras (a Scottish essential with a twist), Malaysian inspired roti (that one got the thumbs up from us), burgers, the one thing, in my opinion, that doesn't work quite so well for sharing as they're just too full of good stuff and you can't cut them to share them very easily and loads more great dishes. Some of the menu items on our second visit had changed which encouraged us to try some other items instead of just sticking to what we had the first time. On our last visit we tried a yummy Romanian dish called mici, minced pork rolls with garlic and spices served with mustard and pickles, really good and I could have eaten a lot more of this one. By the way you'll also want to leave room for dessert too where you can choose everything from sundaes, soft drink ice cream floats to a selection of dessert cocktails for the adults too. It is definitely best to choose a dessert each though as who wants to share all that yummy goodness with others? Go hungry and be prepared to have lots of fun in the process!